“Breakfast is the most important meal of the day,” repeated every parent growing up. Who told them that? What’s the evidence to back it up? Are all breakfasts created equally? 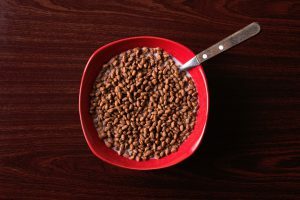 As freelancers we have the freedom and time in the morning to eat more than a cereal bar for breakfast as we’re racing out the door to work, but should we? Let’s dive in and answer some of the tough questions about the ‘most important’ meal of the day. Should I have breakfast? Where does ‘Breakfast is the Most Important Meal’ come from? 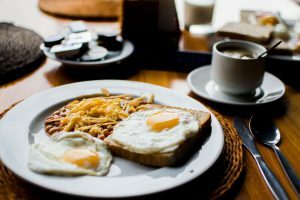 As I mentioned in my article: Easy Diet: no-brainer weight management, the idea that breakfast is the most important meal of the day came about in the 1940’s. 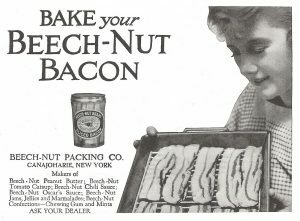 Enter a man by the name of Edward Bernays, the Beech-Nut Company’s public relations expert when they mainly sold breakfast meats. He contacted one of his doctor friends with a proposal. He asked his friend if he would be willing to sign off that having a breakfast rich in protein, with bacon and eggs was better than having a light breakfast. Obviously, this doctor knew where his support came from and said that he would be more than happy to sign off on that. They then sent that same proposal to 5,000 doctors around the US to sign off on as well. Afterwards, Bernays had newspapers publish that proposal as if it were a medical study. Over the years that idea has evolved to not only that a protein-rich breakfast is good for you (which it still is) but that breakfast is the most important meal of the day. As freelancers, we have the time to make a protein and fiber-rich meal first thing in the morning. If you have eggs, fruit, sugar-free yogurt, whole oats that don’t come from a box. Keep it up. 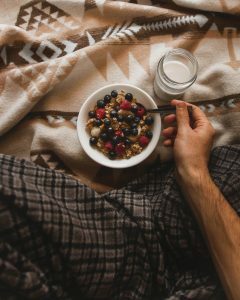 Obviously, a healthy breakfast packed with natural foods is better than nothing at all since going hungry in the morning makes you more likely to overeat at lunch and make bad food choices. However, I argue that eating nothing is better than eating sugar. 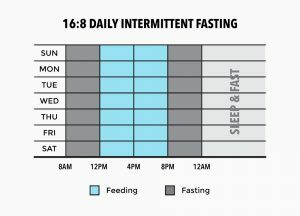 If you’re wondering what Intermittent Fasting is, it’s basically you choosing not to eat for a certain period of time. Fasting has been around for centuries, and many religions still practice it to this day (Ramadan, for example). However, Intermittent Fasting is more like 16 hours of fasting and an 8 hour eating period. You can repeat that cycle anywhere from 1 day/week up to every day. After you finish dinner (8 PM) until you have lunch (12 PM), you can’t have anything with calories. Water, tea, coffee, and any other zero calorie beverages are okay. The point is for your body not to digest anything and use the energy that it has stored up (i.e., that little muffin top those of us who sit all day seem to have). So, Should I Eat Breakfast? I guess I wrote this article to say, “It depends.” If in the morning you pull out greek yogurt with frozen fruit and a couple of soft boiled eggs, then yes, you should eat breakfast. However, if you reach for a Costco muffin and a Starbucks Frappuccino and call that breakfast, I’d say something has to change. Whether that’s starting to eating a more protein-rich breakfast or trying out Intermittent fasting, that’s up to you. However, setting the tone with a healthy breakfast in the morning will change your whole day. You won’t have that 2 PM crash, and you’ll start your day on the right foot. Is Breakfast really the most important meal of the day? Nobody knows actually. But what we do know is that eating a good solid breakfast will set a positive tone for the rest of the day. Remember, we don’t have big companies and coworkers to fall back on and pick up the slack if we’re sick. We don’t get paid days off when we don’t take care of our bodies. Take care of yourself, so we can continue making the freelance community the best it can be. What do you guys have for breakfast these days? What an interesting article. Why am I not surprised that the good old English breakfast idea was born out of a money making scheme ! I am also pleased that you have given me the go ahead for what I have always done and been scolded for. I cannot eat in the mornings. Sometimes I do not eat until around 5pm. I am just not hungry. I guess I have always been an intermittent faster, not through any mental decision but just because that’s what my body tells me. Right you are. Trying to force your body into something unnatural doesn’t make a lot of sense. I was curious, when you aren’t eating in the morning do you drink coffee or tea? Thank you for taking the time to leave a comment as well, truly appreciated! Great article! It’s interesting to know the history behind this phrase especially it’s money -making scheme. I personally believe breakfast is the most important meal of the day as it really sets you off for a productive and positive day. Something I was told as a kid. Breakfast for me is a bowl of oats, various seeds, honey and milk. Delicious! I appreciate you taking the time to stop by and leave a comment. I also think Breakfast is important as it sets the tone for your day. Your breakfast sounds really good and especially healthy! Unfortunately, I know too many people who reach for a Costco muffin or bowl of sugary cereal to start their day and they ask why at 11 am they’re already dragging their feet. Anyways, whether breakfast really is the most important meal or not isn’t all that important. If you think it helps you and it gets your day off on the right foot then that’s all that really matters. Thank you again for stopping by! I definitely think a healthy breakfast is important. Mostly because it gets your metabolism going for the day. I feel people who tend to skip breakfast, more easily gain weight because their bodies are still in “hibernation” mode. Getting your system going helps everything work better. Even if it’s just a banana, you should eat something. I appreciate you stopping by and leaving a comment! You’re absolutely right that eating a ‘healthy’ breakfast is the right way to start your day off. It will, as you say, jumpstart your metabolism and keep you full and energized until lunch. The point I was trying to make was that most American’s don’t reach for a banana. They reach for a box of sugar cereal or a muffin or something that would not be considered healthy. In that case, in my opinion, not having anything would be better than spiking your insulin, blood glucose and everything else those foods tend to do to your body. Anyways, thank you again for stopping by! Blue Light and Sleep – What’s really happening?